Deal making is back on the corporate agenda. In 2014 there were 6286 deals announced in the European region worth € 672,5 bn. This represents an 8% year-on-year increase in deal volume and a 39% rise in deal value. Despite a rather slow start to the year European M&A is poised to build on last year’s momentum. The European deal pipeline is strong and it looks like activity will remain strong. 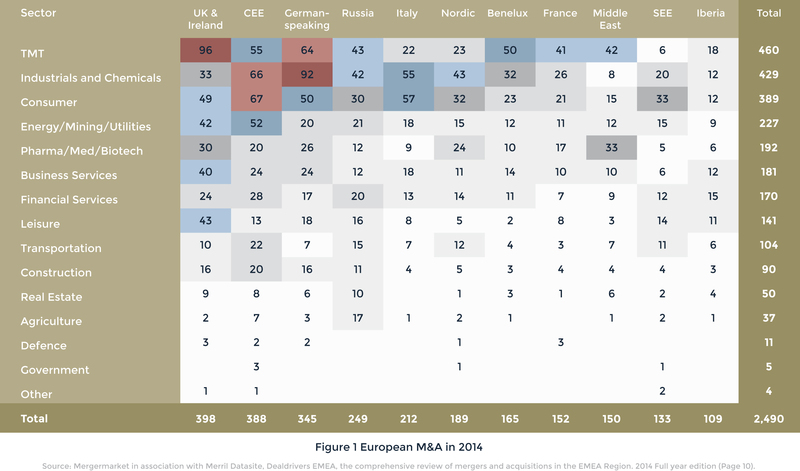 The role of the outside investor in European M&A is growing, especially in de midmarket. Banks are no longer playing their traditional role in funding the financial needs of SME companies. So the outside investor, with cash on hand, is stepping in to fill the void left by the banks. The role of the outside investor is therefore of growing importance, because SME companies are the backbone of the European economy. In the remainder of the article we pay attention to the growing importance of the outside investor in the transfer of the family enterprise. In the Netherlands more than 20.000 family enterprises change owners each year and this number stands to explode in the coming years! Since 2008, Europe has been in a deep financial and economic crisis. Despite some optimistic notes we may hear occasionally, the crisis is still there. That is why we see an almost obsessive search for economic growth developing, with companies are more than ever forced to adapt to the new macro-economic circumstances. They must become more productive, more innovative and more competitive. Those who do not succeed, lose the race. In The Netherlands we have seen some recent examples, such as the threatening downfall of V&D. Outside investors (offering what we call private equity) invest in privately owned companies, that are not listed at a stock exchange. Mostly, they invest for a certain period of time. In this period they co-operate with the management of companies in which they invest. This may pose the valid question whether these outside investors have a positive or a negative influence of the development of these companies, and on the development of growth in general. Therefore, the European Private Equity and Venture Capital Association (EVCA), the branch organization of companies funded by outside investors, has researched the influence of outside investors over the years. The research shows that outside investors have had and still have a positive influence on companies regarding innovation, productivity and competitive power. As said, outside investors predominantly invest in non-listed companies. In Europe this mainly means investing in small and medium-sized enterprises. A large proportion of these are family enterprises. They can, without exaggeration, be called the backbone of the European economy. In The Netherlands alone, there are more than 260,000 family enterprises. In the first decade of this century, family enterprises provided 70% of the jobs in the private sector in Europe. They contributed more than 50% to the EU’s GDP. The importance of family enterprises can hardly be underestimated. That’s why it is important to monitor this segment of the economy. What strikes us then, is that family enterprises suffer from problems with succession. According to the Expert Group on the Transfer of Enterprises, every year more than 600,000 family enterprises change owners. These enterprises represent 2.4 million jobs. The Expert Group also says, that in ten years’ time some 1.5 million enterprises will stop their activities. thus jeopardising more than 6 million jobs. In The Netherlands, too, company transfers are an important issue. Annually 23,000 family enterprises change owners. The average transfer process takes 4.3 years. This means that every year 100,000 companies are struggling with the transfer to a new owner. The economic impact of this struggle is large. It involves 128,000 – 137,000 jobs and a turnover of EUR 5,7 – EUR 7.9 billion. The stakes are high for all parties concerned. Outside investors traditionally play an important role in company transfers and company takeovers. In 1991 outside investors invested EUR 2.38 billion in buyouts, and in 2003 this amount had already risen to EUR 18.42 billion. According to the Centre for Management Buy-Out Research (CMBOR) some 25% of all buyouts concern family enterprises. According to CMBOR, this is because many family enterprises that consider transferring the enterprise to the next generation, cannot find a suitable successor in their own family. Thus the family enterprise has become an attractive target for outside investors. An inquiry into 1,645 companies told us that the lack of a successor means putting the company up for sale. In more than 60% of the cases, present management was involved in planning the succession and in more than 50% of the cases, outside investors were involved. During the buyout process, outside investors are mainly busy with restructuring the company’s financial situation, with streamlining the due diligence process and with negotiating the price with the seller. For the enterprise, outside investors were a sounding board, and they opened new, potential markets. They also evaluated the present management and in some cases they were involved in the search for new management. Once the buyout was a fact, outside investors became major shareholders, on average holding 45% of the shares, with 37% of the shares in the hands of management and some 10% held by the family. The main question is of course, which impact outside investors will have on the company, once the buyout is a fact and the company tries to finds its way in the new constellation. A widely held view is that outside investors drain companies and then get rid of them. In practice, however, we see a different picture. The number of jobs appears to have increased by 67.3% on average. Growth was strongest (388%) in small enterprises with fewer than 50 employees, with great enterprises (+500) being the surprising runner-up. In the latter, the number of employees increased by 150%. Research covered the period 1994 – 2003. Not only the number of employees increased, so did the operational results. In the three years after the buyout, turnover rose by 15.4% on average, as opposed to 13.3% in the years before the buyout. The same upward trend is visible in the development of the operational result. Before the buyout, this amounted to 10.3% on average, while in the three years after the buyout it increased to 11.3%. The number of companies that sought and entered new markets abroad, rose from 73% to 80%. The inquiry cited seems to prove that the role of outside investors during a buyout is positive. Their involvement benefits the enterprise. More than 11% of the companies participating in the inquiry say that their company would have ceased to exist without outside investors.